John Possingham was born at Barmera,South Australia on 28 October 1929 to Albert Victor and Hilda Dora Possingham. He grew up on a small fruit growing property at Berri in rural South Australia that produced raisin grapes and oranges. His primary education was in a 2 teacher school in the hamlet of Winkie, South Australia followed by secondary education at Glossop High School and then Adelaide High School. He obtained his BAgSc (Hons) from the University of Adelaide in 1952, and his MSc in 1955 also from the University of Adelaide, He was awarded a D.Phil from Oxford University in 1957 and a DSc from Oxford University in 1979. 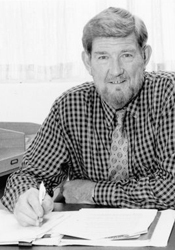 In 1952 Possingham joined the Division of Plant Industry in Canberra as a Research Scientist. Over the period 1952 to 1954 he worked in plant nutrition on a basic project concerned with looking at the function that some of the micronurients played in the metabolism of plants. He studied the influence of various mineral deficiencies on the amino acid levels of plants seeking a diagnostic tool to recognise mineral deficiencies. It was the era when CSIRO had shown that the growth of pastures could be vastly improved by applying low rates of copper, zinc, manganese and molybdenum. He received a CSIRO Fellowship to study in Oxford where his D.Phil thesis was concerned with the role that iron plays in controlling cell division in pea root tips. On completion of his D.Phil in 1957, he was assigned to the British Government’s Biological Response Team for 3 months to attend the Maralinga Atomic Bomb Trials as an Australian participant and observerver. It was thought desirable to have an Australian attend these trials and he has a major publication on the retention of atomic fall-out particles on plant leaves. On his return to the Division of Plant Industry he worked on the role of manganese in the photosynthetic reactions of plants. He was able to show, using radioactive manganese, that this element was essential for the initial steps of photosynthesis and was required to maintain the integrity of chloroplasts. This work was the beginning of his continuing interest in the structure, function and factors controlling the replication of higher plant chloroplasts which continued with the assistance of Post Docs during his entire career with CSIRO. This work formed the basis of his D.Sc thesis to Oxford Univerity, awarded in 1979. In 1962, at the time Otto Frankel was replaced by John Falk as Chief of Plant Industry, Possingham was asked to go to the station at Merbein in the north-west of Victoria, as Officer-in-Charge of the newly renamed Horticultural Research Section. The Section, formerly the Commonwealth Research Station, Murray Irrigation Area, was established in 1927, when the previously existing research facilities came under the control of CSIR. At times Possingham wondered whether it was wise to accept assignment to this facility, west of Mildura on the River Murray which at that time was an isolated post where a handful of researchers were trying to improve grape-drying processes for sultanas. Working on raisin grapes was seen by Possingham to be both boring and illogical and he began looking for something more challenging. To Australia’s incalculable economic and social gain, he became obsessed with reviving the area’s wine-grape industry and subsequently laid the foundations for what has become one of the country’s greatest success stories. Although at the time of his transfer to Merbein he had negotiated a verbal deal whereby the CSIRO would allow him to establish a small group at the University of Adelaide’s Waite Institute, aggressive negotiation was required to make this a reality. Initially staff were located within the Australian Wine Research Institute laboratory and subsequently a modest laboratory was built on University of Adealide land. It was eventually agreed by the CSIRO Executive that the expertise of the Merbein staff about raisin grapes and that of new appointees could be directed to wine grapes. By 1967, five years after his arrival, the research he was doing had become so significant that the section was upgraded to divisional status as the Division of Horticultural Research with Possingham as its Foundation Chief. He subsequently pushed the Executive to establish small horticultural groups in the Northern Territory at Darwin and at Brisbane, Queensland to expand the work of the Division into tropical fruits. The work at Darwin contributed greatly to the expansion of the mango industry in that territory. Finally, with the re-organisation of the Division of Food Research, their Fruit and Vegetable Post Harvest Group was attached to the Division Of Horticultural Research. Possingham remained Chief for the next 24 years, towards the end of which the division was renamed the Division of Horticulture (in 1988). In 1991 he stepped down as Chief but remained as a Chief Research Scientist until his retirement from CSIRO in 1994. During his outstanding career John Possingham spent sabbatical periods at Edinburgh, Scotland (1969), Dusseldorf, Germany (1979), Bangalore, India (1983) and Okazaki, Japan (1985). The sabbatical at Edinburg was used to develop a knowledge of the infant science of nucleic acid metabolism (DNA &RNA) in plants, while the periods at both Dusseldorf 1979 and Okazaki 1985 were to participate in joint studies of the factors controlling the division of higher plant chloroplasts. The sabbatical in Bangalore India was to learn about, and contribute to, the science of growing grape vines in tropical environments, Additionally many shorter trips were made to the grape growing areas of the world to make sure that knowledge about the technological aspects of grape growing was available in Australia. Many overseas experts were guests of the Division and shared their knowledge with CSIRO’s scientists. John Possingham was Vice-President of the International Society for Horticultural Science Leuven, a member of a number of the Expert Committees of the International Vine Office Paris and has served on the editorial boards of a number of international horticultural journals. He is the author of some 250 published articles in grape growing, general horticulture and plant nutrition. He is a member of the advisory board of a number of scientific journals. Mechanical harvesting and pruning – In the early 1970s, Possingham arranged for the introduction to Australia of the fledgling American technology of grape mechanical harvesting. Initially this was seen as a way to overcome the high cost and shortage of hand-picking labour; in the long-term it completely altered the structure of the Australian wine industry. About 70% of our grape crop is now mechanically harvested using Australian adaptations to the technology. A number of companies were interested in reviving the table wine industry that had been wiped out in the 1890s by the fungus, phylloxera, but the high cost of manually pruning and harvesting the high-flavour/small-bunch premium grape varieties put a tight limit on production. Possingham realised that mechanisation held the answer and using the prototypes shipped from the US (one of which was mysteriously spirited to Australia in an RAAF Hercules transport plane), he threw himself into researching the trellising and vineyard management the machines needed. Following the adoption of this innovation, Possingham directed the research of his group into mechanical methods of pruning grapevines. Mechanical hedging and minimal pruning are two techniques CSIRO developed in collaboration with other researchers that are now in use for 50% of our vines. The introduction of mechanical harvesting and pruning of grapevines, changed the face of the Australian wine industry saving it over $200 million a year, compared to the costs of full hand picking. Introduction of improved vine stocks from Europe – This came about when Possingham’s pioneering research caught the attention of French viticulturalists. In a carefully nurtured relationship, which saw leading French viticulturalists working at Merbein during the European winter, Possingham shared his progress on mechanical harvesting in return for the latest knowledge and vine cuttings from France. Significantly, these included the premium grape varieties that have since become the backbone of the Australian industry: cabernet sauvignon, chardonnay, shiraz, sauvignon blanc, cabernet franc, pinot noir and semillon. In the early ’70s, Yalumba, Tolleys and Orlando began planting 200- to 400-hectare vineyards of premium wine grape varieties which, for the first time, could be pruned and picked by machine. It was the beginning of an agricultural revolution which some have predicted will, by the middle of the 21st century, make Australia the world’s largest supplier of quality table wines. Hickinbotham’s plain message was that if Possingham hadn’t been given the creative space in which to stretch his science to its unpredictable limits, Australia may not now have a wine industry. 1991 CSIRO Medal for Research Achievement ‘ for developing production systems to mecghanise Australian vineyards.